Designed by Midnight Entertainment Group in 1995, ICD released Air Cars in limited numbers. No real box was made (it came shrinkwrapped inside a box insert), but the cartridge included a label and manual, along with a picture of what the overlay might look like. 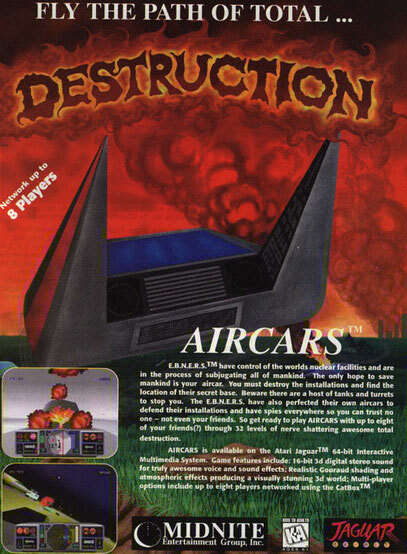 This is an action/battle game in which you must destroy enemy bases while in your Air Car, and it supports up to 8 players using CatBoxes or 2 players using a JagLink. Although better graphics can be found on the Jaguar and control is a bit sluggish, linking 8 players using CatBoxes can be a unique experience. The hard part will be finding those extra CatBoxes and copies of Air Cars.